Alcohol distribution. The three-tier system. Big distribution. All of these terms elicit strong emotions in our industry. We know. We spent last week at the 76th Annual WSWA conference in Orlando where we discussed three-tier distribution with our colleagues. We met with big distributors, small Makers and everyone in between. Do you know what the overall feeling in the room was? Working with distributors within the three-tier system is changing. Has changed. Why? Technology is evolving the way we do business. As the only distributor to also be a technology company, we couldn’t be more excited about this. After all, we are based in Silicon Valley and we are complete tech geeks. Now that we’ve returned from WSWA, we think it’s time to give everyone a quick snapshot of what we see in terms of technology and how it’s changing alcohol distribution. Small producers (Makers as we call them) are getting distribution. If they want to get their products into a market, they can do it. This is new. Prior to LibDib launching, there weren’t a ton of options. But with our model they can get distribution (currently in 3 states). We are growing and our new partner RNDC is working with us to expand our technology-based offering to new markets. Everyone is seeing the need for this. 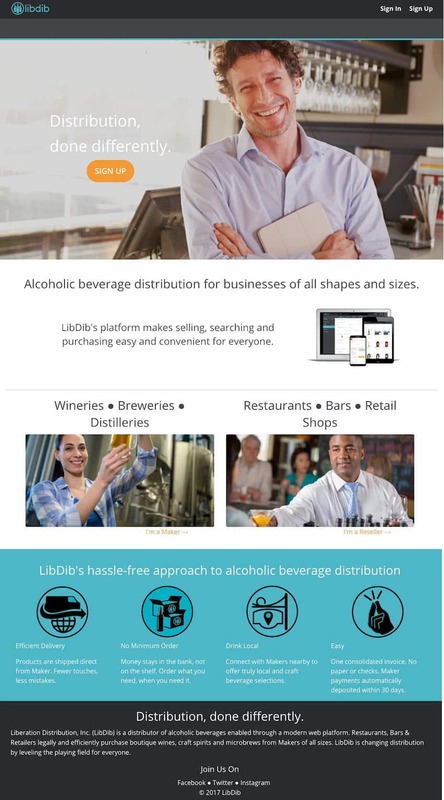 Be on the lookout for further news on how LibDib and RNDC are evolving distribution together. The technology behind this is no small feat. Our team of engineers (which comprises almost half of our company) carefully crafted our proprietary technology for 2 years. We built a platform on solid ground and it’s amazing. Technology makes the lives of Makers and Resellers easier. inviting and encouraging direct communication with buyers, control over POS and marketing materials, immediate account depletion information, etc. All of these features (and more) within the platform to make the lives of our makers and customers easier. In fact many of the features we offer are a result of users asking for them. Technology evolves and will continue to change things very quickly. Regular reorder reminders – LibDib can automatically alert you when it’s time to reorder and with a simple response or text you can place your reorder. Online sample requests. Buyers can request a sample online and taste on their own time. Technology has made it that easy. Encouraging communications between Makers and Resellers. Buyers ultimately enjoy talking to the person behind the brand and technology can make that seamless for both sides. We’ve definitely found that to be true with LibDib. Buyers get access to hundreds of new small production craft spirits and wines. They can browse when they want, create favorites lists, etc. It’s just like any other online shopping experience except only a licensed reseller can buy these products. The technology evolution of the three-tier system is happening. LibDib is excited to be part of it.